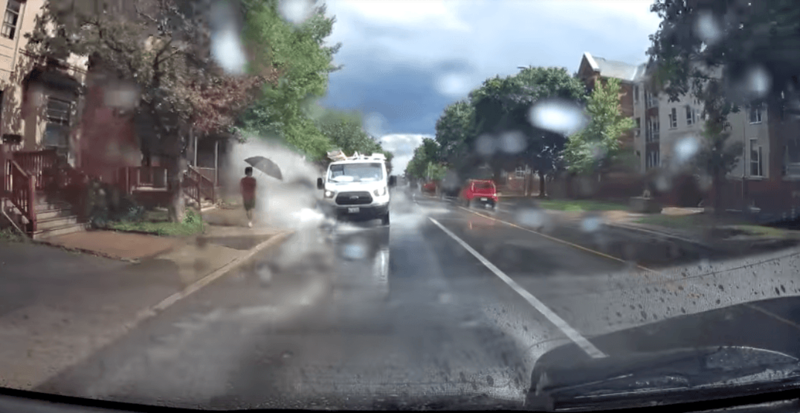 An Ottawa van driver was fired after being caught splashing pedestrians using the company vehicle. A dashcam video, which has now been seen over 780,000 times, surfaced late last week showing a Black & McDonald van purposely splashing pedestrians on sidewalks. At the time, the videographer tweeted at Ottawa Police asking if there was a law for slowing down at puddles to not splash pedestrians and included a link to his video. Police responded saying there is no by-law, but that drivers may be charged with mischief. There is no City By-law or offense under the Ontario HTA for vehicles splashing pedestrians while passing them on the road. There may be possibility of a Mischief charge, but one would have to show intent. The video seemed to land in the hands of the proper authorities and just days after the incident, the driver was fired. “We apologize to everyone impacted by the recent incident in Ottawa of unacceptable driving by one of our van drivers,” stated Black & McDonald Limited on their Facebook page. Ottawa police Sgt Mark Gatien also confirmed the news that the employee was let go, and thanked the officer on patrol who helped assist in the outcome.